If you work in the modern world, you’ve most likely used Outlook at least once. Similarly, if you’ve used Outlook, you’ve probably been infuriated when it didn’t work. 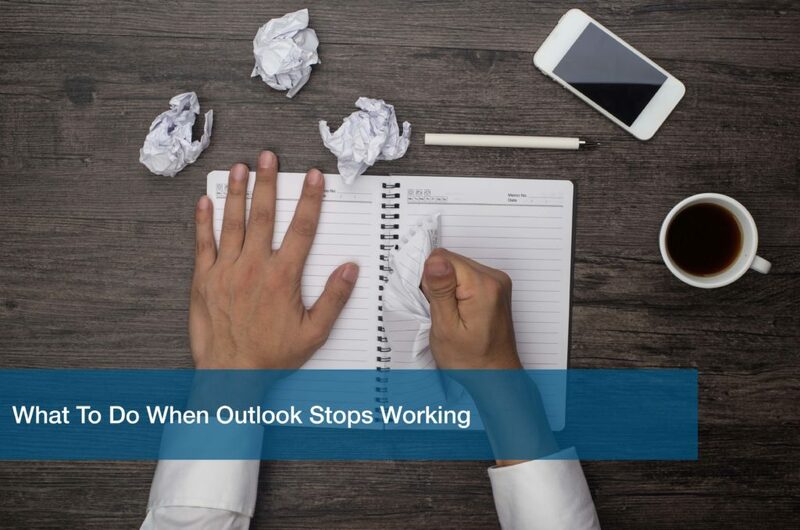 Although Outlook has many advantages to the business world, it also likes to break constantly. Fortunately, most of the issues you’ll encounter with the program are easy to fix, if you know how. Sometimes, your issue isn’t a problem at all. For various reasons, Outlook may compute at a pace equaled only by a beached whale. If you’re emails aren’t popping up, it could just be running slowly. To fix this, you can click the Send/Receive all Folders button (Command + K for Mac users) to try and speed it along. Once it’s done, there is an indicator that will announce “all folders are up to date” on the bottom-right of the window. Note – This will only work if you’re using Windows. If you’ve already sent all your folders, and received nothing back, Outlook may have a bigger problem. It runs slowly like this because it is stuck on something. These are called Add-Ins, and they make your program run so slow it’s basically useless. To troubleshoot this issue, it’s easiest to start Outlook in Safe Mode. Holding the Control key while opening it will do the trick. Running Safe Mode disables a lot of features, so it is not a permanent solution. If this worked, you may just need to disable your add-ons. You can do this by selecting Options, Add-ins, then click “Go” near the bottom of the resulting window. Then proceed to uncheck all the ones you aren’t using. More often than not, Outlook issues are fixed by simply deleting your account then adding it back in. To do this using Windows, simply go to File, Office Account, and click Sign-Out. Remember that doing this will erase all of your customizations. Then, you can click Sign-In on the same page to re-add your account. On Mac, you need to go into Preferences under the Outlook menu option at the very top-left of your screen, click accounts, select yours, and hit the minus button on the bottom of the window. Then, click the plus sign right next to it, and log back in. Unfortunately, these simple fixes don’t always work. If this is the case for you, the best option is to uninstall and reinstall Outlook. This is a rather complicated process which, if done incorrectly, can make the issue worse resulting in more downtime. ITC’s white paper, The True Cost of Downtime, demonstrates exactly what this could end up costing your business. In this case, it is best to contact an IT professional and let them take care of it for you. We use Outlook to keep us organized and up-to-date. As such, issues with Outlook affect our daily lives and work habits. Using this guide, you will be able to solve most of the obstacles Outlook will throw your way.